You will log into your website by typing the website’s URL and adding /wp-admin/ in order to get to the dashboard. You will need to know your username and password. To edit a post, go to the Dashboard by hovering over the name of the site in the top black bar of the screen and then clicking on Dashboard. Then at the dashboard, click on Posts -> All Posts in the sidebar (left hand column). This will bring up a listing of the posts on your website. Hover over the name of the post that you want to edit and click Edit with Elementor. This will bring up the Elementor editing screen. The content is displayed on the right side of the Elementor editor. Content in the Elementor editor consists of rectangular sections. When hovering over a section, a blue section icon appears at the top of the section. Sections may contain columns (vertical) areas. To move a section, hover over the six dots at the center of the blue section icon and drag the item to a new location. A blue bar indicates where a section or widget will be placed. When hovering over a column, a grey column icon appears at the upper left hand cornerof the column. Each column within a section may contain widgets. The column icon can be used to edit columns. For example, right click on the column icon and choose “”Add New Column” to add another column to the section. You can then hover over the dashed line between the two columns to adjust the column widths. Widgets are functional or appearance components that can be dragged from the Elementor sidebar (left) to the visual content space (right), such as the text widget and the image widget. When hovering over a widget, a blue pencil icon appears at the top right hand corner of the widget. By clicking on the pencil, you will open up the content editor. Content is edited in the left hand column, which is the editing panel. After clicking on the pencil icon, you can edit the text of a section by deleting old text and/or typing your new text in the left hand column, which is the editing panel. Do not edit in the area on the right, which is the Live Preview panel because you can’t always be certain where your cursor is located, and not all editing functions may be available to you in the Live Preview panel. When you have finished your edits, click the green “Update” button to update the content. To add a new section, simply drag a widget (e.g., text widget, image widget, other) from the widget panel on the left side of the screen to the editing section on the right side. After editing a post or a page in Elementor and saving your changes by clicking the green Update button, clicking on the three horizontal lines at the top left of the Elementor Widget sidebar allows you to click on the blue bar to “Exit to the Dashboard” (for example when you want to edit another post or page). To add an image to its own section, add a new section and drag the image widget onto that section. Click “Choose your image” in the Image widget in the Elementor sidebar. Select the image in the media library (or click Upload Files if the image is not yet in the library and drag the image onto the screen) and then select the Insert Media button on the bottom right. In the Image widget in the Elementor sidebar, choose the desired image size. Enter a caption if desired. Clicking on the image brings up the Elementor image editor, which allows you to position the image left, center, or right. To add an image to an existing section, start by dragging the image widget onto the existing section, and then follow the instructions above. To add an image at the top of the post, click on Posts -> All Posts. Choose the post to be edited. Hover over the name of the post and click Edit. Scroll down toward the bottom of the post until you see Featured Image in the right hand column. Click Set Featured Image and choose a photo from the Media Library by clicking on it, or upload a file from your computer and select the image. Then click the blue Set featured image button on the lower right. Click the blue Update button in the upper part of the right hand column to add your featured image. Clicking on a hyperlink takes the user to a new internet location. To create a link using the text editor on the left panel, first enter the text to be linked and highlight (select) the text. Then select the paperclip editing icon (“Insert/edit link).” Enter the internet page address the link is to go to in the URL box, or paste the internet page address if you have navigated to it in a separate window and placed it on your clipboard. You can link to both external websites and to documents in your Media Library. Click the gear icon (Link options). Check the “Open in a new tab” box if desired. Click the “Update” or (“Insert link”) button. The link text will change characteristics to indicate the text is a link, usually a different color. Click the green Update button to save your work. On the Dashboard, click on Posts -> Add New, or hover over the + symbol on the top black bar of the Dashboard and click on Post. Enter a title for the post. Select a category for the post. This will control where the post appears on your pages. If your website has been developed using a technique that automatically places posts with certain tags on the appropriate pages of your site (for example, Agendas and Minutes), this step is critical in order for the posts to appear on the proper page. To improve the ability of users to find information on your site, you may wish to add tags, which are keywords that you want to be associated with your post. If your website has been developed using a technique that automatically places posts in a particular column (for example 2019 Agendas and Minutes in a column labeled “2019”), it will be important to add the year as a tag so that the posts will appear in the proper place on the page. Click the blue Publish button if you want the post to be immediately viewable prior to adding content. 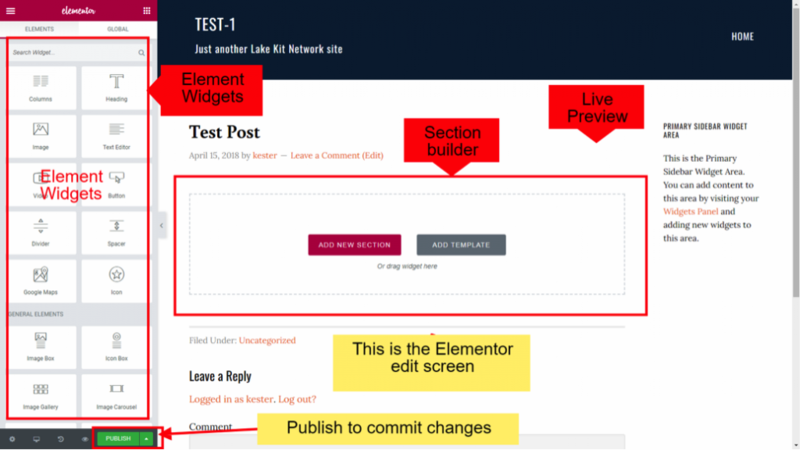 Then click the blue Edit with Elementor button, drag a widget or widgets onto your post, add content, and click the green Update button at the bottom of the Elementor widget sidebar. If you do not want the post to be immediately viewable prior to adding content, click the blue Edit with Elementor button, drag a widget or widgets onto your post, add content, and click the green Publish button at the bottom of the Elementor widget sidebar. Note that clicking the green Publish button will make the post available on the internet unless the visibility of the post is set to Private or Password Protected. 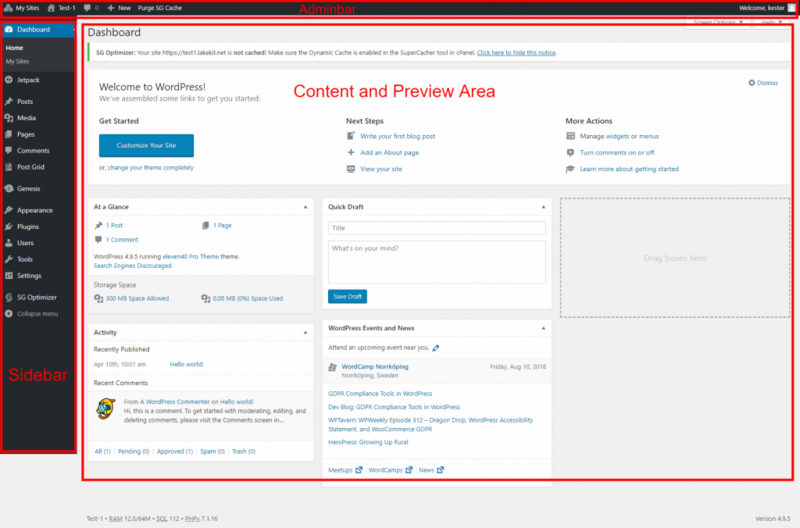 If you wish to add a new page to your website, you can follow the instructions for adding a new post, but start by hovering over the + symbol on the top black bar of the Dashboard and click on Page. Enter a title for the page and continue as above for adding a post. When you hover over the name of a post, you will see two editing options – Edit and Edit with Elementor. The Edit option allows you to change the overall characteristics of the post, such as its visibility, and to add or edit Categories, and add or edit Tags. Categories are used to control where on the website your post will appear, and Tags are used to control the position on the webpage. You can also set or change a featured image for the post through the Edit option. The Edit with Elementor option allows you to add or edit content on the post.